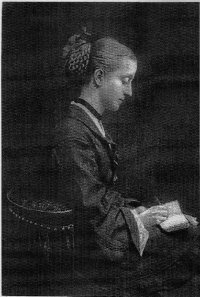 My research has focussed on the family stories of the Victorian writer Juliana Ewing. Her writing is almost forgotten now, but l believe it was critical in developing child characters who were self-determining and who operated successfully outside of the family. In the process of doing my research I discovered a lot of fascinating material which does not have a place in an academic essay. So I am pleased to have the opportunity to share some of this related material tonight. Juliana Horatia Gatty was born in 1841 and died in 1885. Like most of her siblings she was named after Admiral Nelson (Horatia or Horatio) as their grandfather had been his friend and clergyman. The family was large, and Julie, or Judy as she was sometimes called, was the family story teller. She entertained the other children by making up or retelling favourite stories to them. Her own preference for stories was the Brothers Grimm, Hans Christian Andersen and Marrayat’s Children of the New forest. She also read Charlotte M. Yonge’s The Daisy Chain, which was representative of Victorian family stories. The family never had enough money so the mother, Margaret Gatty, edited a children’s magazine called, after Juliana, Aunt Judy’s magazine. Juliana became a major contributor to her mother’s magazine and enjoyed writing stories. Her mother on the other hand only wrote for income and prefered to study seaweed. One year her publishers paid her in kind with a book titled A History of British Sponges and Lithophytes. Eventually Margaret Gatty wrote her own two-volume book on seaweed, British Seaweeds, which was used by marine biologists for many years. Juliana loved animals, especially dogs – as we can see from pictures, such as the one below, that she drew herself. One of the amusing stories about Ewing is that she would routinely ask guests which of the many dogs in the household they wanted to take up to bed with them. She assumed eveyone loved dogs as much as she did. Juliana married a military man and became Juliana Ewing, but they had no children. Because she was sickly she was unable to accompany her husband on overseas postings except once to Canada. Her ildlessness and the fact that she lived apart from her husband probably gave Ewing the time she needed to keep writing, as she had no responsibilities for her own household. Ewing was a contemporay of Charlotte Yonge, author of the family story The Daisy Chain and historical fiction such as The Heir of Redcliff, and Louisa Alcott, author of Little Women. Ewing preceded Mrs Molesworth and E. Nesbit. Between 1861 and 1884 Ewing wrote 11 novels, numerous short stories and fairy tales, songs and translations. Her books were illustrated by famous illustrators of her time: Mrs Allingham, Randolph Caldecott and George Cruikshank. This illustration by Allingham for a Flat Iron for a farthing was entered in the exhibition of the Royal Society of Painters in Water Colours in 1875. It was singled out by the writer and critic John Ruskin who commented favourably on its beauty – no matter, he said what the original purpose of the illustration had been. Whether this is a comment on children’s literature or commercial publishing is unclear. 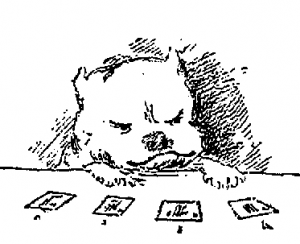 One can see from her correspondence with her illustrators that Ewing was extremely assertive with them. Perhaps this was because she herself had some drawing ability or perhaps the reason was, as Caldecott once said, Mrs Ewing does not require illustrating. She is so graphic. Ewing was acclaimed by Harriet Beecher Stowe, Rudyard Kipling, the historian Young and E. Nesbit. Stowe was especially taken with Ewing’s book Jan of the windmill. Kipling wrote of Ewing’s book Six to Sixteen. “I owe more in circuitous ways to that tale than I can tell. I knew it as I know it still, almost by heart. Here was a history of real people and real things.” It is interesting to note that Kipling’s ‘Mowgli’ legends were used as the basis for the Boy Scouts while Ewing’s Brownie tales were the basis for the Girl Guides. The historian Young claimed her descriptions along with those of Dickens gave the clearest picture available of mid-Victorian life and mores. And Nesbit felt that her own work was inferior to that of Ewing. I would also suggest that Frances Hodgson Burnett was impressed by Ewing to the extent that Burnett greatly made use of the first chapter of Six Fo Sixteen for her own book The Secret Garden. Clearly Ewing was a standard within her own time. 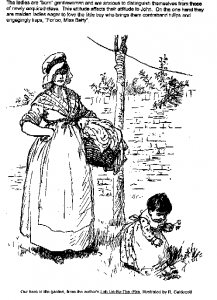 Ewing’s writing draws on the family story genre exemplified by Alcott and Yonge. But Ewing added an element of self-determination that allowed her children to interact and learn from the world outside of the family in a way that other authors had not. While we are now familiar with self-determining children in family novels, such characterisations were unusual in Ewing’s time. In the context of the long essay I used Yonge’s The Daisy Chain and Alcott’s Little Women to compare and contrast with Ewing’s work. I will not be discussing those books this evening other than to point out some of the important elements in them that Ewing diverged from. First, in both The Daisy Chain and Little Women the families shape the child; they perceive it as their moral obligation to do so. Third, the child relies on the family for directing him or her. 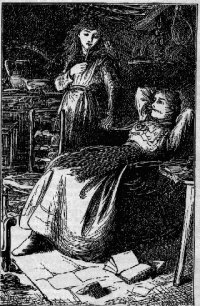 In the books of both Yonge and Alcott, children turn to their parents for guidance even after they have married and left home. As well as comparing these three aspects of the novels, I also looked at their treatment of moral development, education, society and the fight against personal weaknesses (an aspect of moral development emphasised in these books). The books of Ewing I will discuss this evening are The Story of a Short Life, Six to Sixteen and Lob Lie-by-the-fire. So far, what we have seen could be described as the negative example of the Yonge/Alcott theme; weak parents produce flawed children. But Leonard does not become a dissolute self-indulgent youngster during the rest of his brief life. Again Leonard is yielded to with the result that in the excitement of horses and guns and a wriggling puppy Leonard falls out of the carriage and is crippled for the rest of his short invalid life. At frst this tragedy allows Leonard to become even more demanding and more indulged: in his invalid state he strikes his attendants with his crutches. But Lady Jane finally concludes that her duty is not only that of tender mothering, “but the duty of one soul to another, and with this conviction she takes on the full role of parenting which is to teach the child to learn patience and fortitude in spite of his afflictions. When Leonard is eight years of age his mother finally draws the line and his tyrannising reign is at an end. Lady Jane has learned the hard way to be a better parent. But what makes Leonard improve?. Lady Jane’s own improvement plays a part – but it is not of itself enough. Her suggestion to her son that fighting pain is like a military campaign allows other influences – already present – to exert themselves Leonard now has a mission to be brave in his adversity like the soldier, ”V.C. ” (Victoria Cross), whom he idolises. Leonard’s desire to emulate the V.C.’ brings about an about improvement in his temperament and he finds his goal of behaving under adversity a most helpful prop when imitated. Leonard says, if I had not been obliged to be good, I should have liked to hit him hard with my crutch.’ He also notes in his scrapbook the lives of people who though amited are “happy with my fate” like the blind organ tuner. The fact that his mother will no longer accept bad behaviour is incidental to furnishing the child with a model to follow (a model not rooted in religion) and a goal to reach. The change in the child’s attitude and behaviour is effected through practical activities and examples from real life outside the family, not through adult moralising. Leonard’s father, however continues to be a bit of an obstacle. Leonard is eager to retain mementoes of his naughtiness to remind him not to behave that way again. But his father forbids that saying, “Well. I forbid you to remember it so there!. It’ll be naughty if you do. Leonard chooses to die at the barracks surrounded not only by his natural family but by all the militaria that he so enjoyed. The military band provides the music and the V .C. farewells him singing Leonard’s favourite song. In this story the shaping of the child has occurred. as in the books of Yonge and Alcott partly through the efforts of the family. However the child was not (although disabled) confined to the family but had ongoing involvement with the barracks. The child’s direction came from blind organ tuners and military heroes who would never have got in the door of the Yonge and Alcott homes. In Six to sixteen the child Margery’s parents die during a cholera epidemic in India, and from that point she embarks on what is virtually a search for the perfect family. This book takes the form of autobiography. This sense memory of Margery’s, where the mother seems more like a ceramic figurine than a flesh and blood caregiver, is symptomatic of the almost unmotherly role she plays in her daughters life. While Margery has fleeting memories of being held up by her Ayah at the window to witness her mother starting out on early morning rides, and how lovely in appearance she was at all times she says, ” I would forego all these visions for one – only one – memory of her praying by my bedside or teaching me at her knee.” What Margery can only imagine is the motherly nature of Margaret May and Mrs March. But it is not available. From this, Margery determines the importance of an available, instructive parent. Margery is freed from her next possible relations without even knowing about them. Because her greatgrandparents are Catholic they are not considered appropriate guardians for Margery. She does however meet them in the long-term when she is eight. Elderly and elegant, they have ideas which seem extravagant and old fashioned to the eight-year-old child. Margery quickly learns the advantage of providing her grandparents with an early morning curtsy. These small outward signs of respect flatter her grandfather and she is then able to make “almost any demands on his patience and good-nature.” She admits to using these wiles somewhat tyrannically. Here again, there is a distance between Margery and her sweet but not altogether commanding grandparents – in spite of the affection she feels. Eventually Margery returns to the barracks home of the family of Major Buller who had originally taken taken her in when she was orphaned. Although Margery feels grieved at leaving her great-grandparents she is warmly welcomed on her retum to the original family, and she does not perceive her departure from the Vandaleurs as a great sadness. Again, one is aware of her emotional independence. This is not a child who relies on her family for direction. Margery is not shaped by her foster family, the Bullers, whose mores she is critical of. For example petty social activities take up Mrs Bullers time. She defends these as a necessay investment in their daughters’ futures. “I only call on the people you ought to call on [she says to her husband] and keep up few acquaintances for the children’s sake. 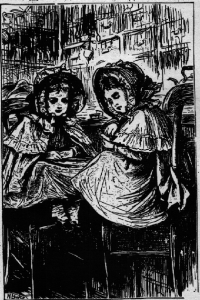 You wouldn’t have us without a friend in the world when the girls come out.” In spite of Major Buller’s preoccupation and his wife’s superficiality, Margory likes them and is not actively disadvantaged by the time she spends with them because she sees their inadequacies adn chooses not to emulate them. Margery’s upbringing is not confined to family life. From the Buller’s household Margery goes to boarding school. Again she assesses the qualities of her new environment with her usual confidence and detachment. the school mistress of the mediocre ‘Bush House’ Miss Mulberry, is not an ogre and the girls are not mistreated; Margery admits that whe was kind-heated and conscientious. What Margery (and Ewing) clearly see as Miss Mulberry’s mistakes are very interesting. The headmistress has no conidence in the trustworthiness of the children adntherefore limits their free time. She watches them conatangy an dexpect to control any slyness on the girl’s part with superior slyness of her own. Although Ewing is not writing about a parent here, we see once agaoin the value she places on the indepencence of the child from the adults responsible for her. I do not know which is the worst, ” I remember her saying,” a religious clique, an intellectual clique, a fashionable clique, a moneyed clique, or a family clique, And I have seen them all. The March and May families of Alcott and Yonge certainly verge on being cliques in their insularity. Margery has moved in her life through some haIf a dozen different homes” from an inadequate biological mother to – in adolescence – a wisely unintrusive Mrs Arkwright. Rejecting the bad and welcoming the good, she seems to prove that children have their own resources and that they can grow well outside of ideal families and determine their own destinies. In Six to Sixteen the child is an orphan of known origins and basically good family but in the last book I will discuss the hero is an orphan of unknown family, most likely a disdained gypsy. This book, written in 1873, takes its name from a colloquial field sprite and adds fairy tale elements to the ‘family story. 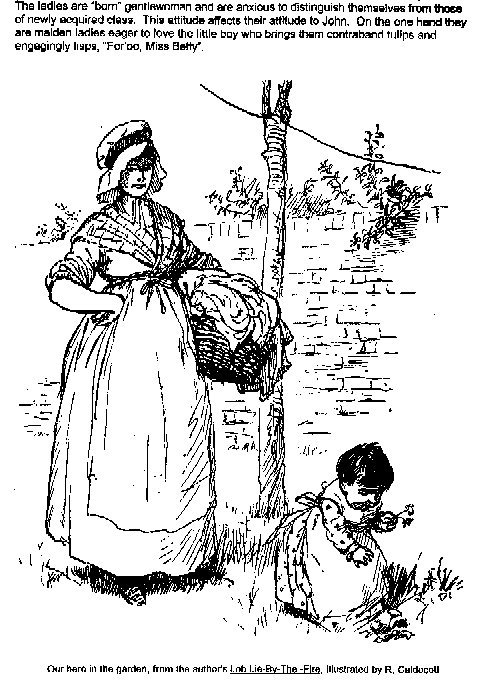 The infant is found amongst the broom by to maiden ladies and named John Broom. Shaped by inconsistencies in his adoptive environment he is to some extent an outcast within the family. Central to the operating structure of this stroy is the issue of class. The bailiff has other weakness than prejudice and drink. Firstly he does not reward the boy when, admittedIy infrequently, the work, is done well; secondly instead of, “a good scolding to clear the air … his slow, caustic tongue was always growling, like muttered thunder, over John Broom’s incorrigible head.” It is not surprising if at the age of about eleven John is tired of living in this dour situation where he is wanted by the ladies for the good of his soul, yet relegated to the bailiff who is liberal with his stick for minor infractions. As most observers, from the parson to the attorney had predicted, John runs away. This is almost an extension of the ideal for Ewing. Just as our previous heroine was well served to be raised without substantial parental oversight, John is able to get the best out of himself by leaving his home environment. He has significant experiences and relationships in the course of his travels which make him decide to retum home. But his return is completely on his own terms as he takes the guise of the fairy tale character ‘Lob’ to ease back into his adoptive family. 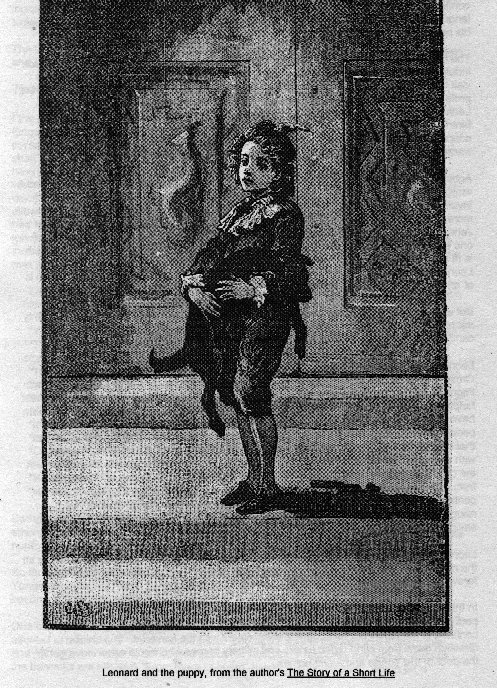 In the intervening years of John’s absence even the sceptical attorney’s attitude has softened and he has admitted, “the force of the habits of early education is a power as well as that of inherent tendencigs.’ The farm-bailif has felt guilty over his rough handling of the boy who had been entrusted to his care by the ladies. He drowns his regrets in drink, and the prospects of the farm and the ladies’ remaining assets decline. Retuming to the folk tale motif of the introduction to the story some vilIagers claim that the boy was ‘Lob’and had taken the luck of Lingborough wih him when he went away. A more obscure intimation is that prosperity departs when mutual trust is not maintained. “The sock’ll bring him home,” said Mrs. Broom, and home he came, and never could say what he had been doing. Lob Lie-by-the-Fire seems to imply that people will act according to their inherited nature but that they can be influenced by caring, moral education. John could never have learned to be happy at home with the ladies as long as they held him at arm’s length. But his own independent journeys teach him the value of what they did provide him, which was a safe and caring home. He comes home prepared to accept the limitations _ his elders and ‘betters’ who, in a way, can’t be blamed for the ideas and attitudes of the social class they were born into. When John first lived with the family he determined his own direction, which was sometimes a source of conflict. When he helped retrieve a cockatoo the ladies worried that he would get hurt. Even when he did help, the effort wasn’t deemed good enough. In his life on the road he made his own choices on moral issues based on personal loyalties. Because of this loyalty he lets a Scotsman in the regiment help him learn restrain. The Scotsman saves John’s money for him so he won’t waste it, as he does, on drink. What we have seen in these three examples from Ewing shows a writer committed to the independence of the child from the family. Children who determine their own destinies, children who make the right decisions without the heavily directing family influences found in The Daisy Chain and Little Women. 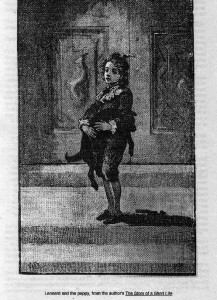 What Yonge and Alcott perceive as a hard fight in the best of circumstances Ewing leaves up to the discretion of children in far from ideal circumstances. Because of the contradictory models the child, of necessity, decides for him or herself the right direction to take. And because of the varied influences the child has a breadth of experience from which to choose in making the decision. Yonge’s and Alcott’s young protagonists grow up in what are, relatively speaking, hot-houses. Ewing’s characters by contrast seem fresh air wildflowers growing in unlikely places and flourishing despite the odds against them. My first contact with the Friends of the Dorothy Neal White Collection was about four years ago when I was taking Alison Grant’s course in children’s literature at the Teachers’ College. Alison informed the class of the Friends’ meeting and I came along. At that time the Collection had its own room in the National Library and I was interested in the collection and hoped to make use of it at some time. Last year I decided to make a research essay (about 10,000 words) part of my course of study for an Honours Degree in English, and I also decided to use the Dorothy Neal White Collection in my research. I thought it would be interesting to find a Victorian children’s author who had been popular and respected in their own time but had not lasted as a classic, the way that Little Women by Louisa May Alcott has. At this time I was taking Kathyn Walls’ paper on children’s literature at Victoria University. When she was invited to speak to the Friends’ AGM in 1993, she inivited the class to attend, and I came along hoping to pick up some useful information. I was lucky enough to find myself chatting with May Atwool, who had been in charge of the collection, and her information was extremety helpful. Mary pointed out that in general the collection had only retained duplicates of titles that were of different editions. I reasoned that multiple copies of books would therefore be a fair indication of their popularity. Over the summer I went down to the National Libray and discovered that my work had been made somewhat easier by a computer printout, by title, of the books in the collecion. I noted down on index cards any book of which there were two or more copies, put the information into my computer, and sorted it by author. Now the extraordinay thing about Ewing was that although there were only two or three copies of each of her novels there were 8 titles, more than any known or unknown author. So she really stood out; and when I went back and read some of her books, I knew I had found an author that fitted my criteria and would be interesting to study. At this point I really want to thank Trevor Mowbray, who opened up the collection to me and helped locate different editions for me to peruse. He made my work substatially easier and my only regret, other than that he’s retired is that he was so effective in helping me that I haven’t needed to return to the Collection for months. This is probably a good thing as it is a fascinating collection and easily distracts from the primary task. Julie K. Eberly was born in Nigeria when it was still a British colony and grew up valuing a trip to England as a time when she could add to her collection of Puffin books. She has undergraduate degrees in English and Theatre from Mt Holyoke College and a Masters in Education and National Development from George Washington University. In 1994 she received a first class honours degree from Vtctoria University (the essay for which this paper was researched formed part of her degree). She has lived in New Zealand for the past eight years, during which time she has assisted on a research project in Women and men in medicine through Otago University and co-authored the book that evolved from that study. She has also worked as a volunteer school librarian. Ms Eberly is currently working on a PhD in Children’s Literature, focusing on Captivity Narratives. In her spare time she enjoys her four children. Ewing, Juliana Horatia, Jackanapes and Other Tales London: G. Bell and Sons, 1919. Ewing, Juliana Horatia, Old Fashioned Fairy Tales 1912.